How many people (including yourself) will be attending conference? First and last names of ALL immediate family members (including yourself) who are requesting airfare or travel assistance? If you are requesting a travel scholarship, how do you plan to travel (by plane or car)? If you plan to travel by car, what is the estimated total mileage roundtrip? If applying for Child Care/Youth Program, how many children are enrolling in the program and what are their names and ages? 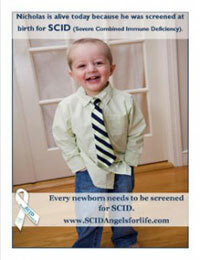 What form of SCID do you or your child have? Please use this space to briefly describe your financial need and the benefit you hope to derive from attending the conference (you may cut and paste the same letter you submitted to the IDF for their Hotel Scholarship application). All TRAVEL SCHOLARSHIP awardees must pre-register with IDF and attend all SCID/CID conference symposiums. The deadline for TRAVEL scholarship applications is May 1, 2019. SCID Angels will contact all schoarlship applicants regarding their award status no later than May 8, 2019. The maximum value of an airfare scholarship is $1,000/family and can only be used to purchase travel to/from the conference. Once you’ve emailed a copy of your paid receipt to SCID Angels a check will be sent to the purchaser for the total amount of airfare, not to exceed $1,000. Again, you must book and purchase your travel before you will receive any reimbursement from SCID Angels. If you do not purchase your tickets and email or fax a copy of your receipt by the deadline, your scholarship will be forfeited and automatically given to another family. Email receipts to Heather@SCIDAngelsforlife.com or fax to 863-647-9537. **Please note, registration and hotel costs are not included in the travel scholarship mentioned above. By checking here, I acknowledge I've read and understand the above terms.